Availability: The Application form of the GEEE 2019 will be available on the official website of the GEEE 2019 from 1st December 2018. Eligibility: The candidates who are eligible to apply for the GEEE 2019 may fill the application form from official website. Official Site: The candidates who are eligible to apply can log on to the official website. Valid Details: The candidates are required to have a valid personal email ID and Mobile Number and it should be active during the entire process. Note: Request for change of Email ID or Mobile Number will not be determined under any circumstances. Details: Fill your personal and academic details in online application form. Note: The candidates are required to fill in the details asked in the form carefully without making any spelling mistake. Photo Upload: Aspirants should upload a colored photo and signature of them with a size of 80kb. Under no circumstances, he/she should share/ mention Email ID or Mobile No. to/or of any other person. The candidates do not send the hard copy of the GEEE 2019 Application Form after the process of completion. The candidate must use only their personal Email ID or Mobile Number and Request for change will not be determined. Mode: The candidates can make online payment only. No other mode of payment will be accepted. Fee: The Cost of GEEE 2019 Application is INR 500/-. Payment through: The candidates can pay by Credit Card/Debit Card/Paytm Wallet/Netbanking. Once the payment is made, the system will generate a registration slip. Take a copy of the payment slip and the application registration slip for future reference. Application process: Once the application process of GEEE 2019 has been completed successfully, the registered candidates should download and print the registration slip and the payment slip for the future reference. Admit card: The candidates should complete the Application Process of the GEEE 2019 to download the admit card which is a mandatory document for the examination which will be sent by the university to the candidate's provided email ID. 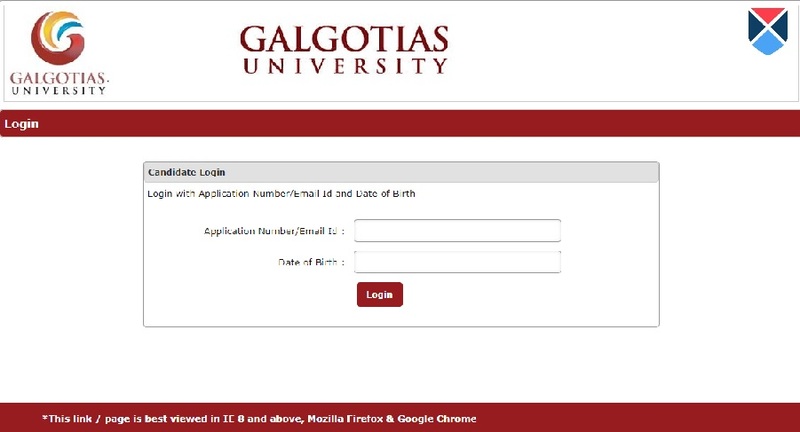 Is there any kind of Managemnet or NRI Quota available at Galgotias University? The candidates have to apply to Galgotias University through their entrance exam - GEEE. There is no Manangement or NRI Quota. All admission is been done completely on merit basis.